Many of us have done this as a child. We have clipped a part of a plant and kept it in water hoping that the plant will grow with roots coming out. This works with some plants. You are able to see roots grow from the clipped piece and soon it starts to grow into a complete plant. This is hydroponics, and we have done this without knowing that it is a part of agriculture. The term hydroponics derived from two Greek words, “Hydros,” which mean water, and “Ponos,” meaning work. It can often be confused with fish farming or gardening, but the term closely relates to agriculture and scientific researches, rather than gardening or fishing. Hydroponic farming can be a great way to address shortage of food and the increasing demand of food around the world as the population keeps on growing and the resources does not. The land available for agriculture is decreasing as farm lands are continuously being used for developing other sectors and industries around the world. 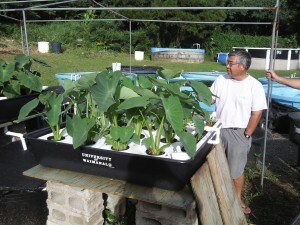 Hydroponic can especially benefit the third world nations where land is scarce and overpopulated. If you would like to have a kitchen garden in your house, but have no space in your backyard, hydroponics could be the right thing for you to grow your own fresh vegetables. Hydroponic is a part of agriculture where plants are grown in a solution or liquid with nutrients. This is usually done in water with fertilizers in it for plants to grow, and it does not require any other medium such as soil, sand, rocks, gravel, etc. This process of agriculture can be further classified into processes based on how the nutrients are used and supplied. They are open hydroponics or closed hydroponics. In an open hydroponics, once the nutrients are supplied to the roots or once the plant is fed through the water, the nutrients are not recycled or reused. 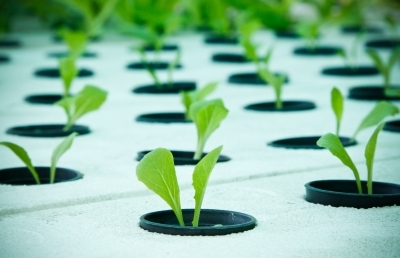 In a closed hydroponics, the nutrients are collected, recovered and reused or recycled. Hydroponics, as opposed to plants growing on land, allows you to regulate the amount of nutrient a plant can receive. Because you provide nutrients to the plant directly, you are able to control the growth of the plant by varying the amount of nutrients you supply. Generally, a hydroponic plant can grow much rapidly and has a much higher yield than a plant grown on soil. Therefore, it allows you to grow a large number of plants without much efforts and cost, and get huge returns. All green plants make their food through a process called photosynthesis, where they combine carbon dioxide in air with water and produce glucose, which they store as food, with the help of chlorophyll, a green substance present in the plant cells, and sunlight. When there is no soil available for the plants to draw nutrients form, a solution must be added in the water to supply them with nutrients. There has to be a constant flow of water and nutrients to support the plant growth. Based on the nutrition supply to the plants, there are six different types of hydroponics in practice today. 1. Aeropnic : In this kind of farming the roots of the plants hang up in the air, and are misted with nutrients after certain intervals of time with a pump. This is a high tech method where a timer, a reservoir, a pump and nozzles, and a nutrient solution is needed. 2. Hydroponic Drip Growing System: This is a very common system of hydroponic farming where the plants are sprayed with nutrients with a submersed pump and the excess nutrients are collected from the tray and recycled. 3. Ebb and Flow Growing System: this system feeds the plants by temporarily flooding the feed tray with feed solution and then draining the solution back into the reservoir. This process is also controlled by a submersed pump and timer. The feed is supplied several times a day. 4. 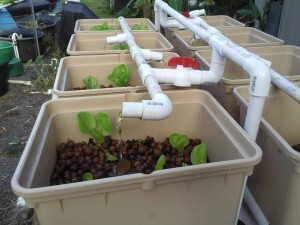 Wick Growin g System: this is the simplest system for growing hydroponics. The nutrient solution is supplied through a wick pump to the roots. There are no moving parts in this system. 5. Water Culture Growing System: this system works predominantly for the leafy plants such as lettuce. In this system, the plants float with Styrofoam attached to them in the feed tray. The nutrient and solution is suppliant to the plants in the tray with a pump and also a air pump is used for supplying air in the tray. 6. Nutrient Film Technique (N.F.T.) Growing System: in this system the nutrients are supplied constantly to the tray through a pump on one end and collected on the other end into the reservoir. This system needs the pumps to work all the time and no timer is needed.